Noluvuyo is pursuing a B.Mus. (Ed) degree at the University of Stellenbosch. She is an inspiring teacher at the Cape Philharmonic Orchestra’s Masidlala Strings Music Project, and currently co-leader of the Cape Philharmonic Youth Orchestra. It is her dream to become the first fully qualified Xhosa-speaking violin teacher in Cape Town, and to have a positive social impact in her community. “The bursary from the Peace Quartet meant I could complete my certificate course in music at the University of Stellenbosch while working to support my family.” ~ Noluvuyo. Abel’s journey from a talented thirteen-year-old boy to a world-renowned musician is an inspirational story of passion and determination. After teaching himself to play the cello Abel was awarded a scholarship at the prestigious Royal Northern College of Music in Manchester. Today, Abel’s impact is expansive, performing as a soloist, orchestral musician, chamber musician and improviser with the world-folk-fusion quintet, Kabantu. He has been described as “a virtuoso: a man on the threshold of international acclaim” by the The Quarterly Review and has received numerous awards including the Standard Bank Young Artists Award 2016/2017, RNCM Gold Medal, Worshipful Musicians Company Silver Medal award, the Sir John Barbarolli prize (UK) and the RNCM Concerto Prize. Abel was given financial support by the Quartet of Peace at a critical stage in his overseas student career. He has participated in fundraising events for the Quartet of Peace project in South Africa and the UK. 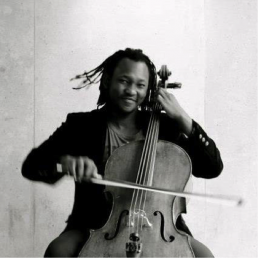 Thapelo is currently pursuing a master’s degree at The Juilliard School having trained at the Interlochen Center for the Arts in Michigan as well as the Eastman School of Music. Hailing from Bloemfontein and driven by a desire to see change in the world around him, Thapelo plays in the Uhuru Quartet, a group that aims to support women who have experienced homelessness or domestic violence. Lieva studied under Jan Repko and Jiafeng Chen at the Royal Birmingham Conservatoire where she received a BMus(Hons) degree (first class) in July 2017. She is currently in the second year of a Masters in Music Performance at the same institution under the tutelage of Pavel Fischer, Oliver Wille and Jiafeng Chen and will complete her studies by June 2019. In addition to her studies and performances, Lieva is a committed teacher in the ARCO initiative alliance which provides regular distance-learning in music tuition for children in Soweto. After completing her current degree, Lieva hopes to pursue further studies in music therapy. “This would not have been possible if I was not able to continue my studies in the UK. The help I have received from the Quartet of Peace has made this possible and for that I am very grateful.” ~ Lieva. Elsabé has in 2019 been appointed the conductor of the Odeion School of Music Camerta at the University of the Free State. 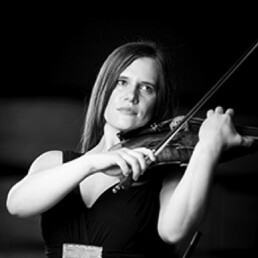 In addition to her appointment, Elsabé has established “Sinfonietta” – a violin and viola study in Bloemfontein that currently trains 27 students. She has recently returned to South Africa after studying under the supervision of Dr Louise Lansdown at the Royal Birmingham Conservatoire where Elsabé graduated with both a Master’s Degree (2015) and an Advanced Post-Graduate Diploma (2017). 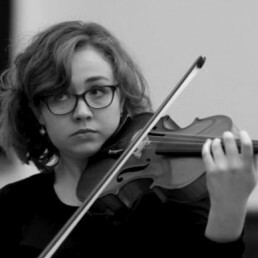 Prior to her studies, Elsabé acted as leader of the viola sections of the SA National Youth Orchestra and the Miagi Youth Orchestra, and has toured in Europe with the latter. “The Quartet of Peace Trust helped tremendously to provide funds for all my music study endeavours, also to build international relations. I am immensely thankful to them, because without their support I wouldn’t have been able to acquire all the necessary skills to do what I do now.” ~ Elsabé. Dane’s determination and flare have seen him selected to complete an advanced course at the University of Stellenbosch. 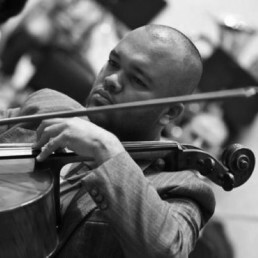 He has attended cello master classes with Maria Kliegel, Susan Salm, Barbara Marcinkowska, Julian Lloyd Weber and Kurt Baldwin and his talent has propelled him through the Youth Orchestra into the ranks of the professionals. Dane is an inspiration to young musicians, teaching with the Cape Philharmonic Orchestra Outreach and Education Programme. “Thanks to the Peace Quartet and the bursary awarded to me I was able to complete the Advanced Diploma in Performance at the University of Stellenbosch.” ~ Dane. Shakeel is a student at Berklee College of Music in Boston. He is an expansive and exciting musician playing across genres in improvisation, African jazz and traditional South African music. 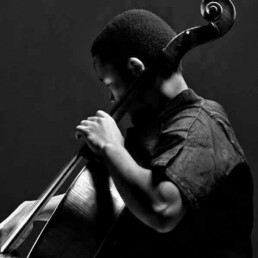 In addition to his studies, Shakeel’s professional experience has seen him play alongside the likes of Nduduzo Makhathini and Kyle Shepherd as well as with the ensembles of Linda Sikhakhane and Mandla Mlangeni. 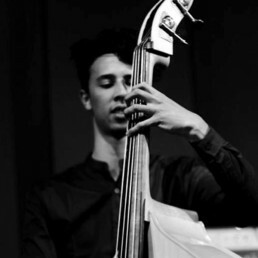 Shakeel has worked with contemporary popular musicians such as Asanda Msaki and Beatenberg, in addition to the local jazz circuit where he has played with renowned drummer Louis Tebogo Moholo, and pianist Hilton Schilder. “I would personally like to thank Leon and the Trust for your support in this endeavour. Without your help this experience would not have been possible.” – Shakeel. Shaeema started playing the violin only six years ago, but has already qualified as a Suzuki violin teacher. Currently pursuing her studies under Prof. Farida Bacharova at UCT, Shaeema is also an inspiring role model and teacher as she runs the Cape Philharmonic Orchestra’s Atlantis programme and is the Youth Orchestra’s acting concert master. 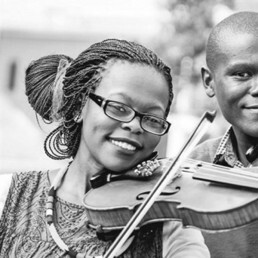 “The QoP bursary enabled me to receive practical lessons at the University of Cape Town and to participate in workshops training techniques of violin improvisation, equipping me to teach violin in Atlantis and at the Philharmonic’s music academy. I enjoy teaching and giving back to my community.” ~ Shaeema.